A team of researchers at Cornell University has begun exploring the idea of adding tactile sensation as a means for interacting with robots. 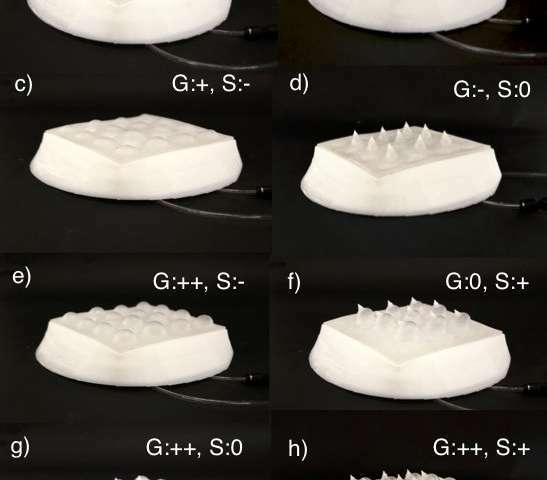 To that end, they have created a robot skin that can produce goosebumps or spikes depending on a robot's mood. The team has presented a paper describing their efforts at this year's International Conference on Soft Robotics. Up until now, the researchers note, scientists have mostly given robots human-like expressions of emotion. They give robots expressive faces, for example, or the ability to slump or slouch when sad. But other animals, they note, use their skin to express themselves. Cats for, example, can raise the fur on their necks, dogs the fur on their backs, and many birds ruffle their feathers. Humans do have a limited ability to convey emotion with their skin, the authors note—we get goosebumps when scared, cold, or sometimes when aroused. In this new effort, the researchers sought to expand on this idea as a way of allowing robots to communicate with humans via touch. The result is a test robot that offers expressiveness with its eyes, as usual, but which also has pads on either side of its head for expressing itself tactilely. The pads are covered with elastomer skin that is manipulated by programming inside the head. Each pad has two grids of texture units—texture units are places where channels push air upward, creating bubbles. One of the grids is forms goosebumps, the other spikes. When deflated, the goosebumps merge seamlessly with the base. The spikes have to be sucked slightly below the base to prevent them from being felt. The computer inside the head controls an air pump to provide pressure. To interact with the robot, a person places their hands on the pads. 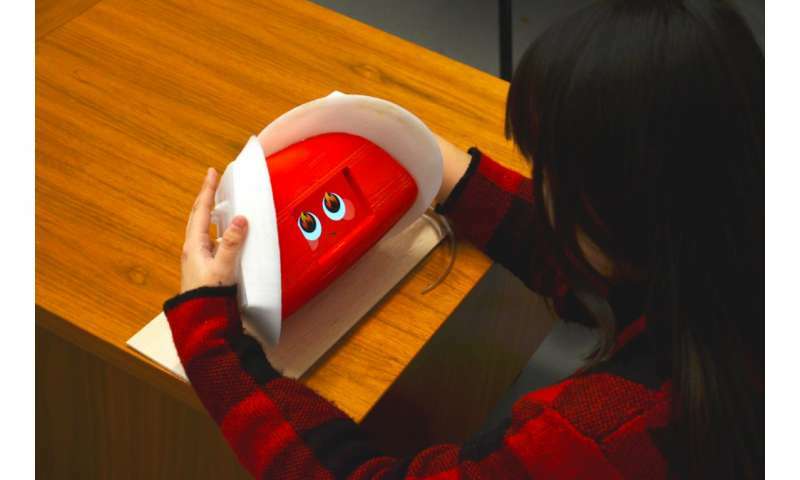 By combining the actions of the bumps to different degrees, the robot is able to convey a wide variety of emotions such as anger, surprise or happiness. The researchers suggest their emotional skin could serve as the basis for allowing robots to interact not just with hearing-impaired people, but also for situations that require quiet—or someday, perhaps, a degree of intimacy.